Graffiti Shield of Anaheim Ca.,makers of protective sacrificial films for a variety of surfaces, began selling their patented products in 2013. Graffiti Shield manufactures the finest quality protective films for Glass, Metal, Stainless Steel, Mirrors and more. Protective films are used to protect and repair Stainless Steel, Glass, Mirrors and a variety of other surfaces that can be damaged by vandalism or abuse. For more information visit www.graffit-shield.com to see the many uses and applications. 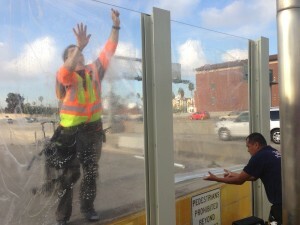 For information about Mass Transit applications, follow this LINK.Contact Xlnt Tint, Owings Md. for more info at 410-257-5511.